Vaulting is gymnastics on horseback and combines the skills of both gymnastics and horsemanship. It provides for both individual and also for team participation in sport. Vaulting improves a rider's seat, balance, rhythm and coordination as well as their confidence on the horse. 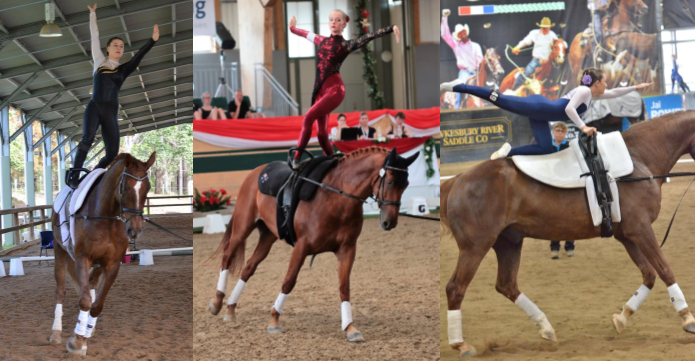 In many clubs in Europe a period of vaulting is a prerequisite to riding. Vaulting is one of the most spectacular, and at the same time safest, of the equestrian sports. It is an ancient sport dating back to the Minoan period demonstrating flexibility and mobility whilst on horseback. This was particularly important when horses were widely used in conflicts (horses were active in war through to the end of WWII ). In competition (similar to skating and gymnastics) there are compulsory routines as well as freestyle and it is all performed to music, so musical interpretation is also important. Success in vaulting requires the training not only of the competitor but also of the horse. The execution of the more difficult vaulting movements requires high levels of agility and rhythm as well as strength. The moves are practised on the floor and on a barrel before being transferred to the horse. At the higher level, movements on the horse are executed at the canter and for this to be done successfully the vaulter must not only be in control of their own rhythm but must also interpret and predict the rhythm and capabilities of the horse. In order to withstand the rigours of competition, and of regular practice, which is essential for improvement, both the vaulter and the horse need to be fit. In addition, it is important for a group or team of vaulters to have more than one horse available for practise and use.